From the inimitable woman who popularized Italian cuisine in America, Marcella Hazan’s simple and elegant manual on how to shop for the best ingredients and prepare the most delicious meals is a must-have for every home cook. 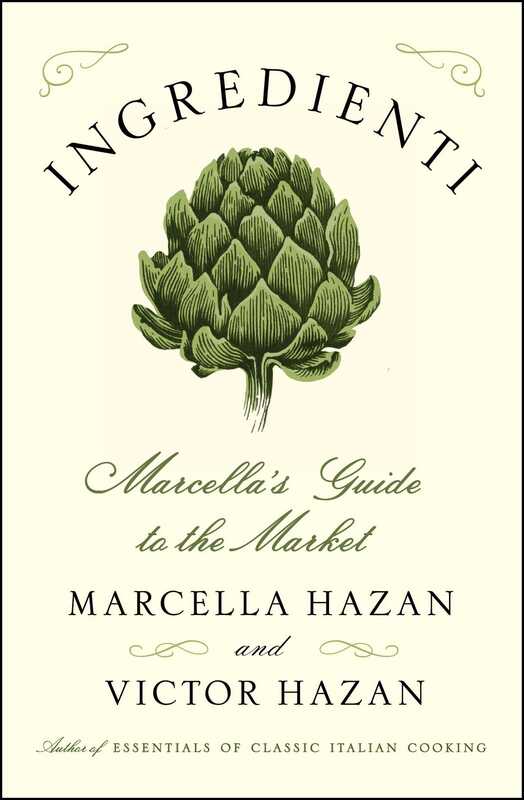 When Marcella Hazan died in 2013, the world mourned the passing of the “Godmother of Italian cooking.” But her legacy lives on, through her cookbooks and recipes, and in the handwritten notebooks filled with her thoughts on how to select the best ingredients—Ingredienti. Her husband and longtime collaborator Victor has translated and transcribed these vignettes on how to buy and what to do with the fresh produce used in Italian cooking, the elements of an essential pantry, and salumi. Before you know how to cook, you must know how to shop. From Artichokes to Zucchini, Anchovies to Ziti, Ingredienti offers succinct and compelling advice on how to choose vegetables, pasta, olive oil, Parmigiano Reggiano, prosciutto, and all of the key elements of Marcella’s classic meals. Organic isn’t necessarily best, boxed pasta can be better than fresh. Marcella’s authoritative wisdom and surprising tips will change the way you cook. Her clear, practical guidance in acquiring the components of good cooking is helpful wherever you choose to shop—in supermarkets, farmers’ markets, specialty food stores, or online. Based on sixty years of almost daily visits to the market to choose the ingredients of that day’s meal, Ingredienti is a life’s work, distilled—an expression of Marcella’s judgments, advice, and suggestions. Uncomplicated and precise, this volume will be essential to home cooks eager to produce meals in the same delicious style Marcella was the first to introduce to America. Marcella Hazan (1924-2013) was born in Cesenatico, a fishing village on the northern Adriatic shore of Italy. She studied for a career in the sciences and received two doctoral degrees from the University of Ferrara in Emilia-Romagna. In 1955 she married Victor Hazan, an Italian-born American, and moved with him to New York, where she began teaching Italian cooking classes in her apartment. In 1973 she published her first cookbook, The Classic Italian Cook Book, which introduced Americans to authentic Italian food. Her cooking schools in Italy draw students from around the world. Hazan was the recipient of two Lifetime Achievement Awards (from the James Beard Foundation in 2000, and the IACP in 2004) and a knighthood from her own country. She was the author of five additional classic cookbooks and a memoir. Victor Hazan, Marcella’s lifelong collaborator and writing partner, is an authority on Italian wine and food. He is the author of Italian Wine. He lives in Longboat Key, Florida. "Much is said about using the very best ingredients to make the very best food, but few can boast having the undisputed queen’s voice in their head when shopping or preparing a dish… Marcella’s blues-singer voice is as clear in this indispensable tome as it was when we shared lunches over the years. Her wit, her supreme and hilarious sarcasm and most of all her complete confidence in choosing the precise and exact best ingredients from the infinite number of things available to the modern cook make this book the perfect handbook to carry shopping everywhere and anywhere." "An indispensable reference volume forprofessional and home cooks." "A wonderful, practical and deeply poignant book... the perfect retroactive companion to [Marcella's] cookbooks. Ingredienti is also laced with occasional asides from Victor, which come like beautiful footnotes to their long life together." "A compact trove of sound, personal advice about selecting, storing and using produce, condiments, cheese, cured meat and other marketbasket essentials." "Leave it to Marcella to help me see standby ingredients in a whole new light... you'll feel like you're rubbing elbows with her in the kitchen." "A new little handbook from an old master... you will find bushels of guidance to help make you a better cook... Hazan's words stay in the head. They give steady encouragement to the hand reaching for the glory of the season." "A simple, modest summary of how to choose, prep, and store a selection of Italian [food]... it got me thinking." "Perfect summer reading for the food enthusiast... will have you hearing Hazan in your head every time you select an artichoke or purchase an eggplant."